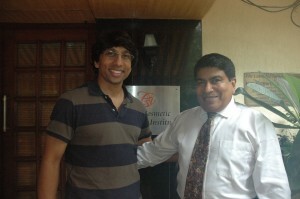 Dr. Prasad enjoyed spending time with Dr. Thomas at his Mumbai practice and observing his work and techniques. Dr. Prasad also had the opportunity to host Dr. Thomas when he visited him at his New York City practice. Recently, Dr. Prasad traveled back to India to spend time with family and visit with Dr. Mohan Thomas, a highly-regarded cosmetic surgeon with a practice in Mumbai. Dr. Thomas is well known among Bollywood stars and sits on the advisory board of Femina, India’s most popular women’s magazine. As leaders in cosmetic surgery, Dr. Prasad and Dr. Thomas often share their experiences and knowledge with each other. Both doctors see patients from around the world and have a lot in common, especially their expertise in helping patients achieve their ideal appearance using state-of-the-art techniques in combination with their philosophy of caring for patients as they would their own family.